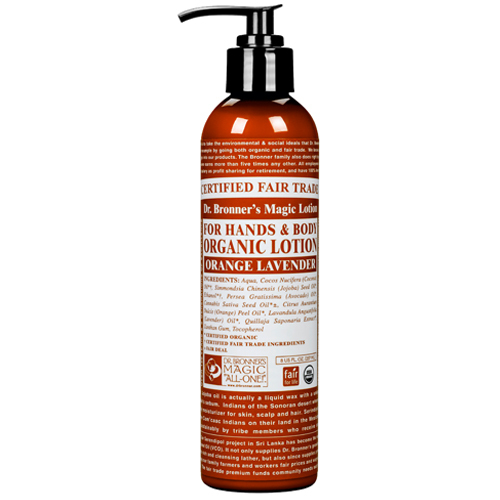 Dr Bronner`s Organic Orange Lavender Hand & Body Lotion contains organic jojoba oil which moisturises dry skin exceptionally well, due to its unique similarity to the skin`s natural oils. Organic coconut oil assists absorption and organic hemp and avocado oils help keep skin smooth and supple. Organic ethanol is used as a natural preservative at a level that helps absorption without being drying. Dr Bronner`s have used only the finest organic essential oils for fragrance. Aqua, Organic Cocos Nucifera (Coconut) Oil*, Organic Simmondsia Chinensis (Jojoba) Seed Oil, Organic Ethanol, Organic Persea Gratissima (Avocado) Oil, Organic Cannabis Sativa (Hemp) Seed Oil, Organic Citrus Aurantium Dulcis (Orange) Oil, Organic Lavandula Angustifolia (Lavender) Oil, Organic Quillaja Saponaria Extract, Xanthan Gum, Tocopherol. Massage Dr Bronner`s Hand & Body Lotion onto your skin immediately after towelling off from your bath or shower to seal in remaining moisture. Below are reviews of Dr Bronner`s Organic Orange Lavender Hand & Body Lotion 237ml by bodykind customers. If you have tried this product we'd love to hear what you think so please leave a review. This hand and body lotion smells good and feels lovely and silky. Only problem I find is that it can sting a little if skin is broken. I guess it must be the orange oil doing this, so I avoid using this when my skin has any cuts or abrasions. Smells lovely and is easily massaged into the skin. I will be buying this product again.